OMG!!! My last pie of The Year of Pies! I love a good challenge so I really loved making a pie for every Friday. Pie Day Friday! No Bake Cookie Crusts are awesome for pudding pies. I gave away a lot of pie. A LOT. Price’s favorite pie was the Caramel Pie. I loved all the pies for different reasons. My favorite chocolate pie: Thin Mint Cookie Pie. My favorite chess pie: Lemon Chess Pie. My favorite fruit pie: Streusel Topped Peach Pie. 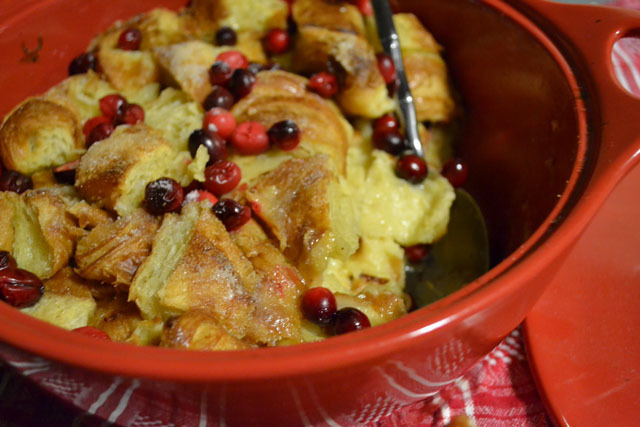 My favorite pie inspired recipe Overnight Apple Pie Breakfast Pudding. My favorite savory pie: Supreme Pizza Pot Pie. And twist my arm favorite is the Reese’s Cup Marshmallow Peanut Butter Cookie Pie. OMG so good!!! This No-Bake Eggnog Pudding Pie was another great pie. It actually feels good to end the year with this pie. It is a pie that is guaranteed to make holiday lovers happy. It’s so holiday. Sure, I could have done something complicated to show off all the sweet skillz I learned but I’m already in confident in what I learned this past year. Plus, it’s the busy holiday season so let’s stick with something easy! A quick graham cracker crumb crust and a just as easy eggnog flavored pudding based filling. Perfectly! As eggnog is very rich, this pie is very rich. Normally I would cut a pie into 8 slices but I would actually cut this into 12 slices. I know, smaller slices. Ghastly! But trust me on this on. It’s delightfully rich so just pace yourself. I really hope that you enjoyed The Year of Pie as much as I did! It was a blast to try something to challenge myself. To make the crust, combine all of the ingredients in a bowl. Pour the crumbs into the deep dish pie plate. Chill for 30 minutes. To make the filling, beat the cream cheese until smooth and fluffy. Add the instant pudding. Slowly beat the mixture while gradually pouring in the eggnog. Scrape down the sides as needed. Gently fold in the Cool Whip until the filling mixture is well blended. Pour the filling mixture into the chilled crust. Sprinkle some graham cracker crumbs and cinnamon in the center of the pie. Return to the refrigerator for at least an hour prior to serving. Keep chilled for up to 3 days. One thing that I’ve always wanted to do at the holidays is make eggnog. I really love eggnog but it really is a treat. I figured this year I wouldn’t have any until I made it to make sure I don’t over indulge and I would actually get around to making it. It was so easy and so good that I’ll be making it again when I go back home to Connecticut for Christmas. I recently saw this article in The New York Times about eggnog, making it, and comparing store-bought eggnog vs homemade. The author felt that a cooked custard eggnog has better taste and texture than a typical eggnog that does not completely cook the eggs. I’m not too worried about eating raw eggs as I’ve had them in cocktails and eat runny eggs just about every weekend so I could have gone with an quick eggnog but I wanted to focus on making one that really tasted awesome. I really enjoyed the process of making this eggnog, although I immediately goofed on the directions. Nothing major but I put in all 4 cups of milk into the sauce pan instead of just 2. I just kept going from there. Cooking the eggnog took the most time and attention so it will cook slowly and evenly. It took about 20 minutes for the milk, egg, sugar mixture to get thick enough. I was aiming for just a bit thinner than being thick enough for the back of the spoon test since eggnog is pretty thick. While the author remarked that she prefers a dark rum with her eggnog I used bourbon as that was in the house. I used the 1 1/2 cups that was called for, which resulted in an eggnog with a real kick. If you prefer a more subtle flavor then I suggest mixing in 1 cup first and tasting it at that point. Since eggnog is not a fan always a favorite, Amanda brings an Eggnog Quick Bread to this week’s Thirsty Thursday. Hey, just because it’s not a drink doesn’t mean it doesn’t count! It uses a great bevie to flavor it! So festive and creative. In a medium sized saucepan, heat 4 cups milk over medium low heat. Do not boil and stir occasionally so it does not burn. Turn off the heat. In a mixing bowl, combine the the sugar into the egg yolks and whisk until thick and pale. Whisk 1 cup of the warm milk into the egg and sugar mixture. 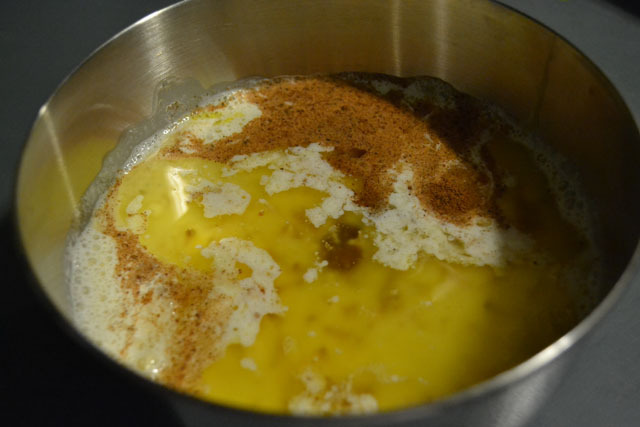 Slowly add the warm egg sugar mixture into the rest of the milk in the saucepan. Put over low heat again, stir regularly until the milk mixture has thickened. Turn off the heat and then quickly stir in the cream. Put a bowl inside another bowl bowl and fill the space between with ice water. Add the milk mixture to the bowl and stir occasionally, until chilled. When completely chilled, stir into a punch bowl and add rum. Beat the egg whites until they form soft peaks and then fold them into the eggnog. Top each serving of the eggnog with freshly grated nutmeg. I will be the first person to tell you that I was not ever going to sign up with twitter. I ended up caving out because of this article and the rest is history. I love how twitter has put me in touch with such great blogs and people. Through twitter connections I have gotten to know Pam, and last month when I was on her blog I saw this post I learned about the Improv Cooking Challenge Group. I could not pass up a fun group that prompts you monthly with 2 ingredients to develop a recipe from. Starting with December the 2 special ingredients are: Eggnog and Cranberries. I toyed around with this combo for a bit…. 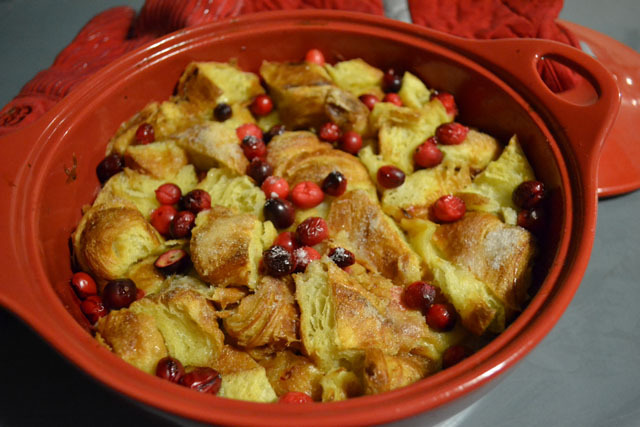 an eggnog flavored bread with a cranberry glaze, an ice cream, or even a pasta dish. 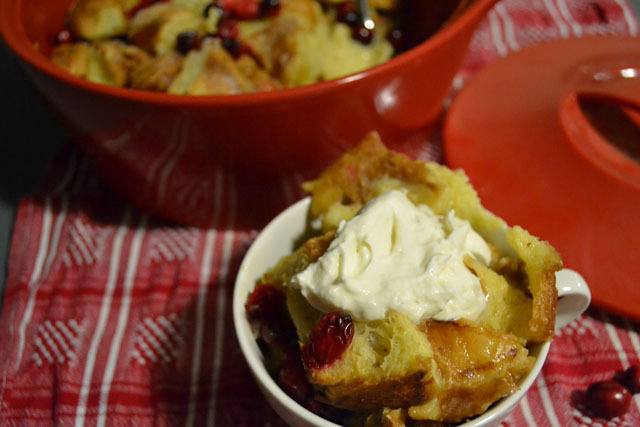 I decided to go with a bread pudding with an eggnog base and the cranberries would be mixed throughout the bread pudding. Preheat oven to 350. Grease a baking dish, and set on a sheet pan. Set aside dish. 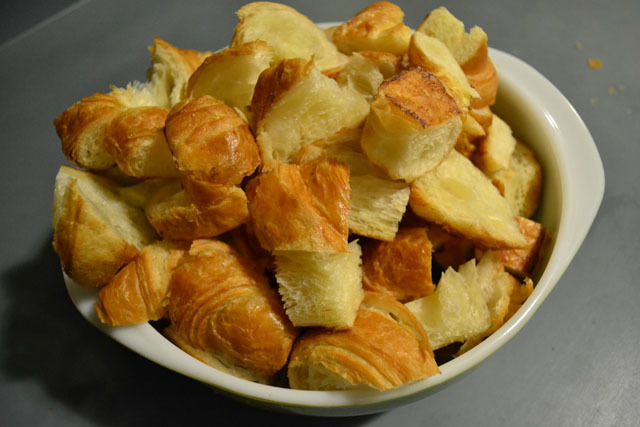 Cut 1″ cubes out of the croissants. Set aside in a large bowl. Combine the light cream, eggnog, eggs, sugar, nutmeg, and cinnamon. Mix well to combine. 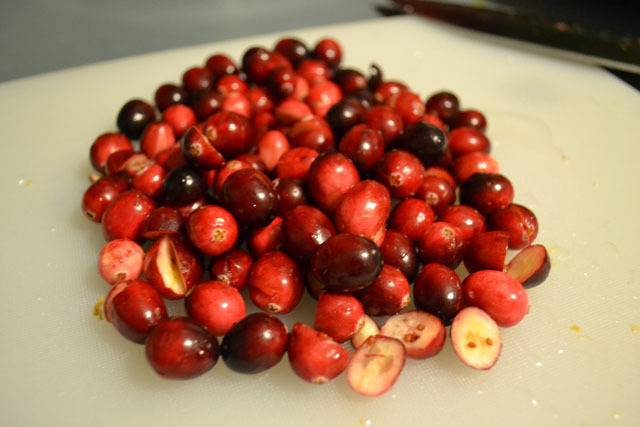 Give the cranberries a rough chop. 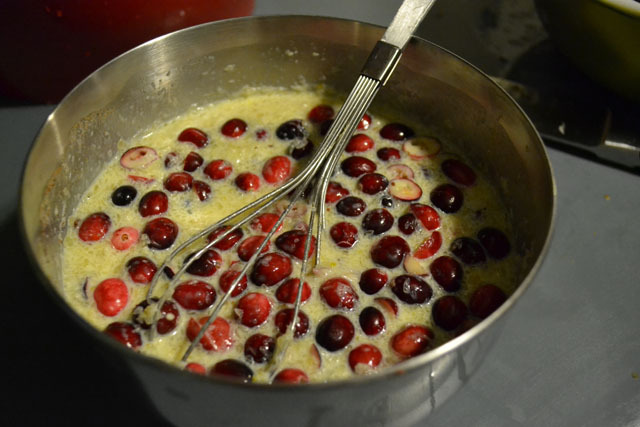 In a small skillet, heat the cranberries on low for 5 minutes, or until they start to get warm and softened. Add the cranberries to the liquid mixture. 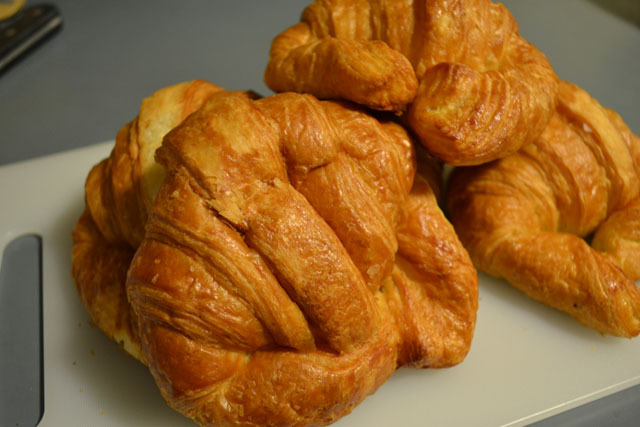 Pour the mixture over the pieces of croissant. Gently mix to combine. Let sit for 15 minutes. 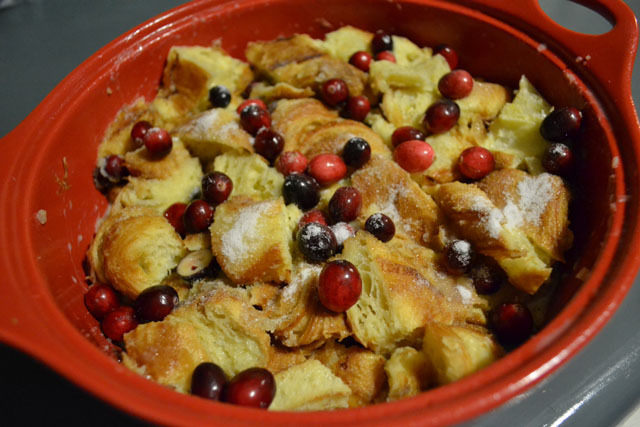 Bake for 45 minutes, or until the bread pudding is golden brown and when you gently separate pieces in the center they are not excessively moist. Let sit for 15 minutes prior to serving, serve warm.